If running has taught me anything, it’s that nothing is a given and you have to work for what you get. It may have taught me other things too. It may also have re-taught me stuff I already knew but had forgotten. Anyhooo, the Paris Marathon 2014 was a race in which I had planned to do really well. I wanted to beat my previous marathon PB (PR if you’re from across the pond) of 3:28 and possibly smash it by running under 3:20. In the summer of 2013 I had suffered with shin splints or possibly a hairline fracture in my left leg, which kept me out for 3 months. I was back training by November and was slowly getting back up to speed. Unfortunately, in February, I felt a similar pain start in the right leg. I decided to rest immediately to let it settle. I took 3 weeks out with minimal training. In March, I ran the Eastbourne Half Marathon in 1:42 which is pretty poor for me, but understandable as I had taken so much time out and it was my first race of the season. I had pulled out of the Brighton Half, about which I was fairly gutted. You can watch my film of the Eastbourne Half here. Preparations for my PB attempt had taken a small but not insurmountable setback. Having read a great deal about running and marathon training in particular, I was well aware of the advice which many of the top runners seem to follow, that is to run your long runs at a slow pace. 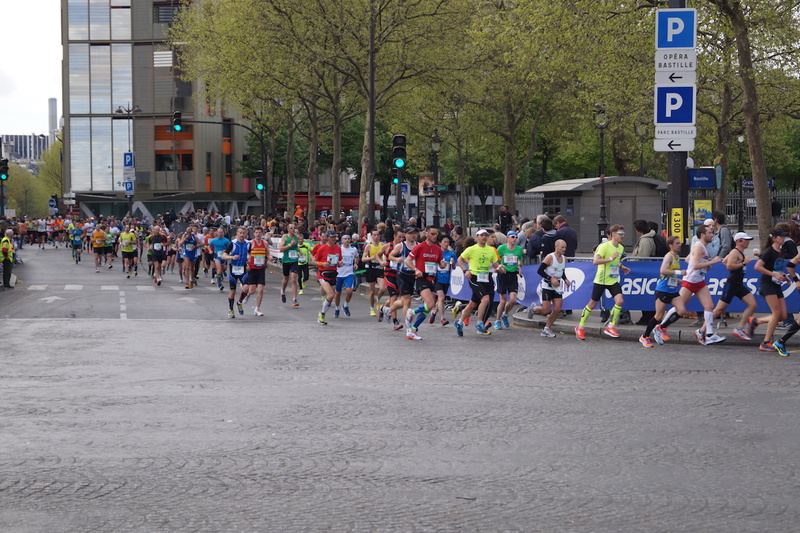 Slow being around a minute per mile slower than your planned marathon pace. I decided I would follow this advice too. However, looking back over my stats, it’s clear that I didn’t do nearly enough long runs, slow or otherwise, in the final weeks before the Paris Marathon. One of the major plus points of my training and prep for the Paris Marathon was the Worthing 20 Mile Road Race. I have run this race twice before. The first time in 2012, I took Lucozade Gels and was terribly sick. I struggled in at 2:48. In 2013 I faired much better and finished in my goal time of 2:39. This year, having just run the Eastbourne Half badly and not feeling very fit, I didn’t expect great things. 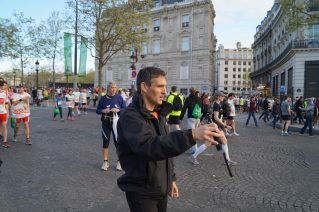 However, I decided to try to hang on to Mark, the 7:30 pacer. I thought I would try to stay with him as far as possible and see what happened. To my amazement I was able to hang on most of the way and finished in 2:31. A personal best by 8 minutes! 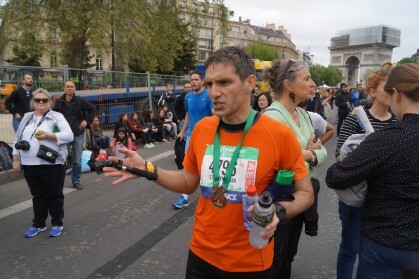 I couldn’t fathom how this had happened and foolishly took it as a positive sign for the Marathon de Paris. We travelled to France on the ferry on the Thursday before the race and got there in time for me to go for a final training run. I had decided to take my GoPro camera along and film myself running. So I wanted to test out what it felt like to run with the camera. 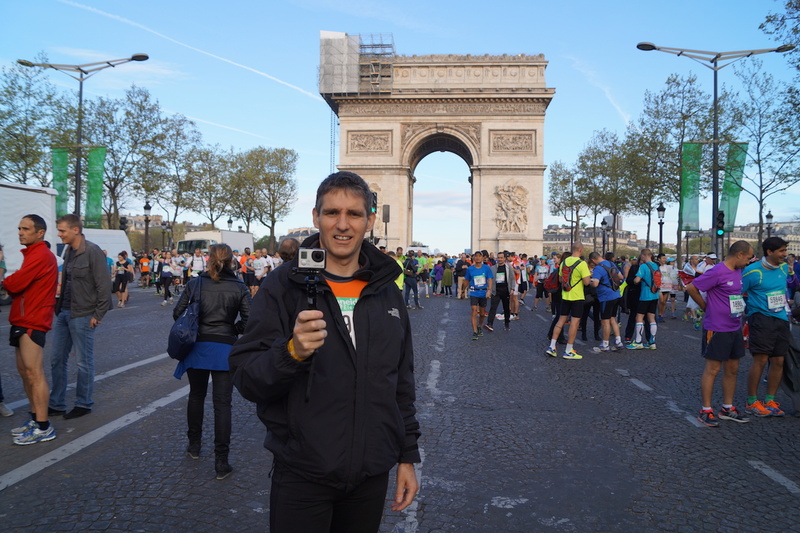 This is what I filmed on that run from La Defense to the Arc de Triomphe and back, total of around 11km. 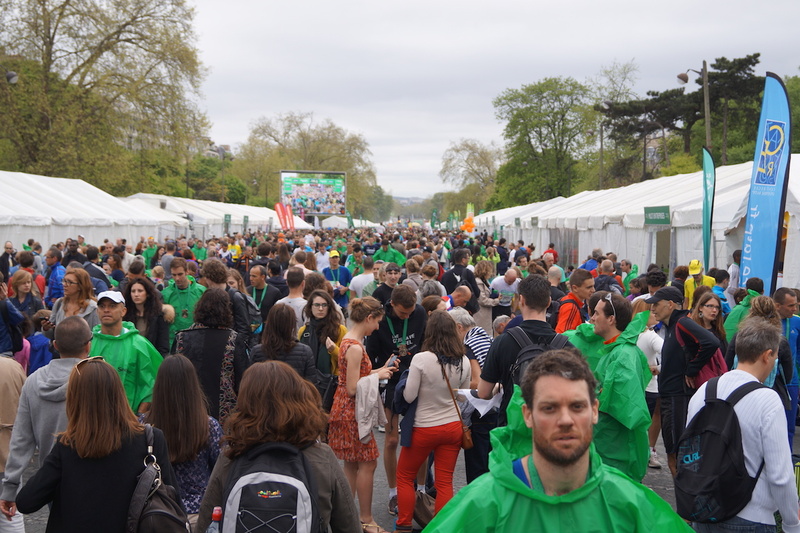 I made many rather foolish decisions in the run up to the Paris Marathon 2014 and I was about to make one more potentially disastrous decision. I think it was on the morning of the race, but it may have been in the 48 hours before, I decided to try to follow the 3:15 pacer. 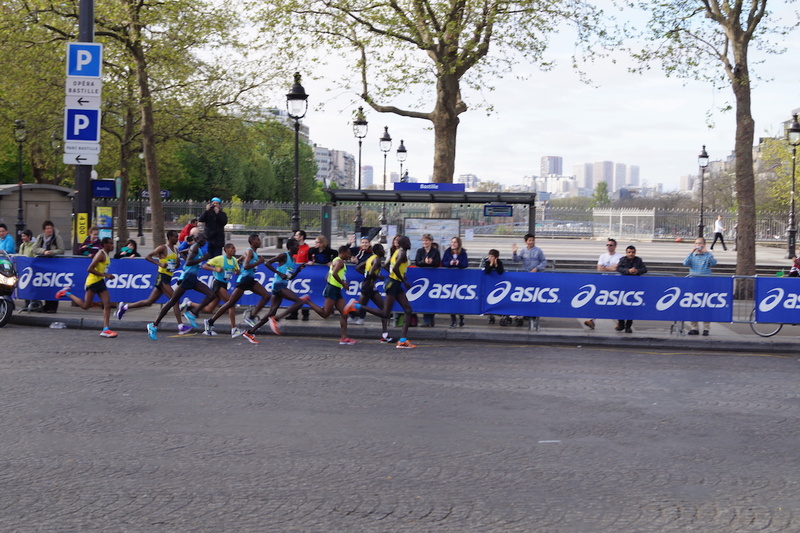 My plan was to follow the pacer as far as I could and drop off late in the race to finish in 3:20 or thereabouts. 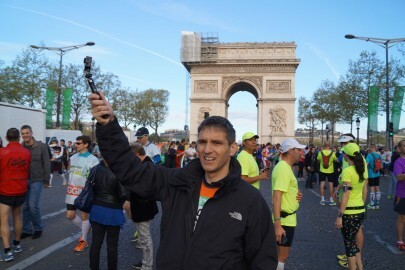 My rationale was that I managed it for the Worthing 20, why not here in Paris? Looking back at the video I made, there are so many small indications early on that I wasn’t in the right place to do it. Mentally I was unsure, confused even about why I had run so well in the Worthing 20. Deep down I knew I wasn’t fit enough to run at 3:15 pace. Furthermore, my race nutrition needed a lot more work. I’ve not got on with any of the gels I have tried over the years and I’ve struggled to find something to use instead. What’s worked reasonably well has been something called GlucoTabs. They contain 4g of carbs per tablet and melt quite easily in the mouth. Problem is I have to take one every two miles and consequently I risk stomach issues. But I decided I’d stick with this as it seemed to work ok last year, when I got my PB. I prefer raspberry over the orange flavour. My plan was to take a gulp of water at each 5k water station and not take any other liquid on board. However, a couple of days before I started drinking Powerade to get my body used to it, in case I needed some en route. The day before the race, I started piling on the carbs, eating loads of pasta and drinking lots of shakes. The problem with this approach is that it makes me feel bloated. 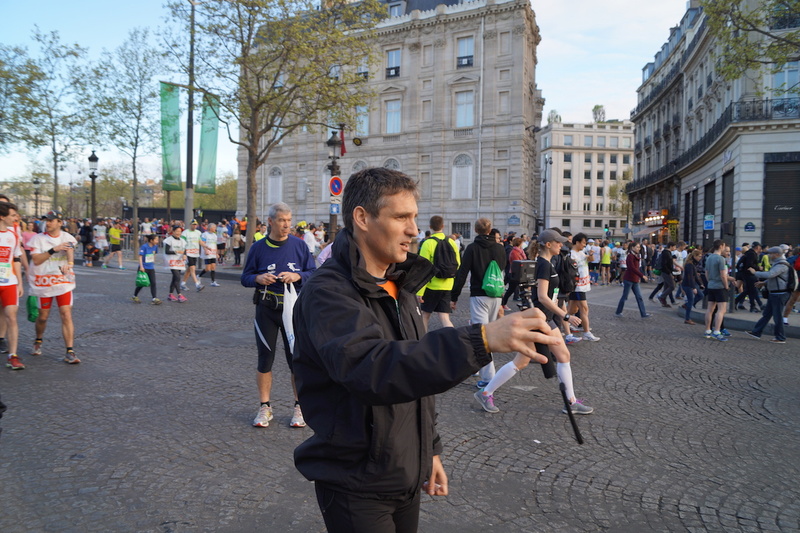 I ate so much in the 24 hours before the Paris Marathon 2014 that on the morning of the race I could hardly get anything down. I felt I must do though so, when I got to the start line, I really did feel fat and bloated and not really in the mood to start running fast! Not long ago I purchased a GoPro camera, primarily for work, so I can film some wedding footage from the air with my quadcopter. But I thought I could utilise it to film races. 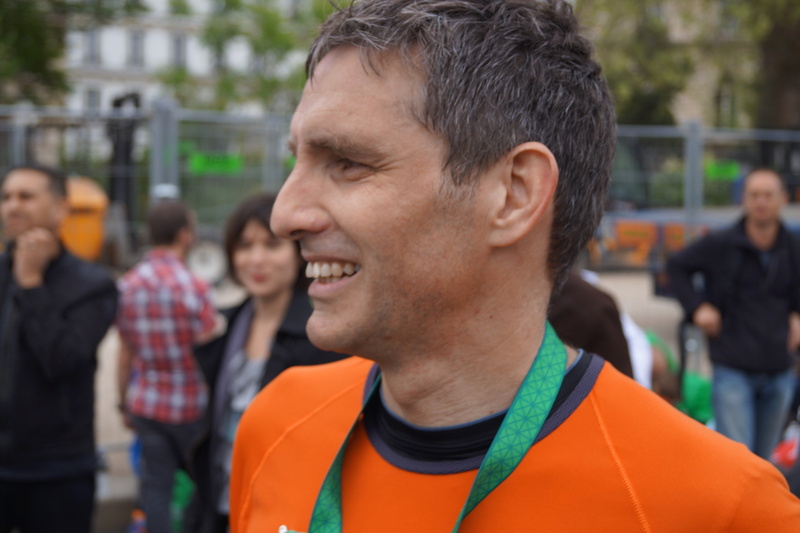 My wife thought it was a terrible idea and that it would impact on my pace and finish time. She was probably right! 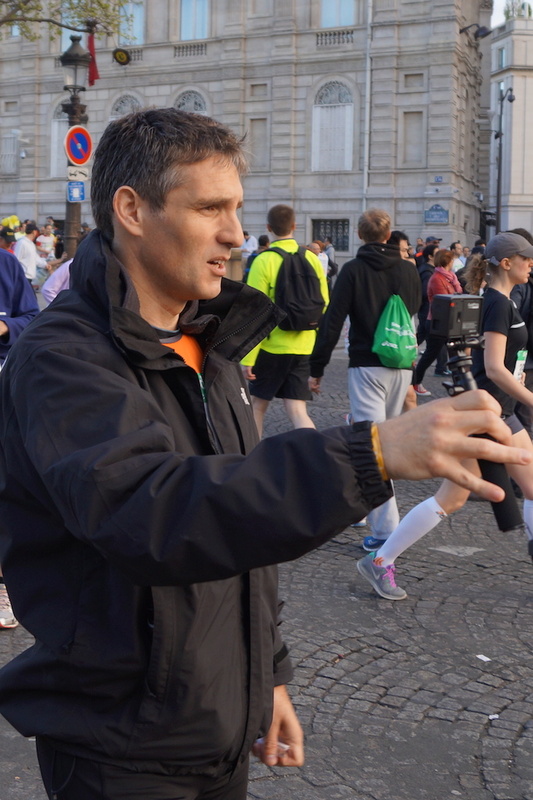 Still I lined up with my GoPro on a selfie stick and set off following the 3:15 pacer. Despite my wife’s objections, I did find the GoPro pretty light and easy to carry and I didn’t feel it was impeding my running. What was impeding my running was my fitness! I just felt slow. By 5k I was already out of breath so decided to slow up a bit and let the 3:15 pacer go. In my opinion, he did go out way too fast for a 3:15 finish. We did the first mile in 7 minutes. 3:15 pace is around 7:20 per mile. It’s one of the first lessons of distance running. Don’t go out too fast. Try to maintain an even pace through the entire race. I went out way too fast for my fitness level and even by the half way point I was really tired. But the wheels really came off at 18 miles. I had to walk for a little way. The problem was then that I started eating extra food from the aid stations and started getting stomach sloshing. However, it wasn’t too bad. The main problem was tiredness. I had been on target to beat my PB up to around 18 miles and then I seriously slowed. I got to 23 miles walk-running and had to stop at a mobile cafe for a drink. I staggered up and got 10 euros from my pocket and asked for a coke. A man nearby saw the state I was in and took pity on me. He quickly handed over the correct change and handed me the can. I was very grateful to him. I must have looked terrible! So I was running and walking the final few miles. My goal of a 3:20 finish was long gone and my baseline aim of beating my PB had also now faded away. When the pacer for 3:30 overtook me with a few miles to go, I had to pull everything I had out to even finish under 3 hours 40 minutes. I finally crossed the line in 3:37. My third marathon and my second fastest time. By the time I did cross the line I didn’t care about missing my PB, I was just pleased to finish. 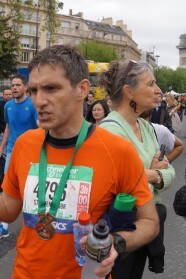 Last year I found my wife very quickly after the race. This year I couldn’t see her and I couldn’t phone her because my phone had died during the run, as had the battery on my GoPro. I had to stop filming from 20 miles which was a shame as filming my progress had been taking my mind off the pain. I eventually came across a chap taking photos for a college project. He asked if he could photograph me and agreed, as long as I could use his phone. 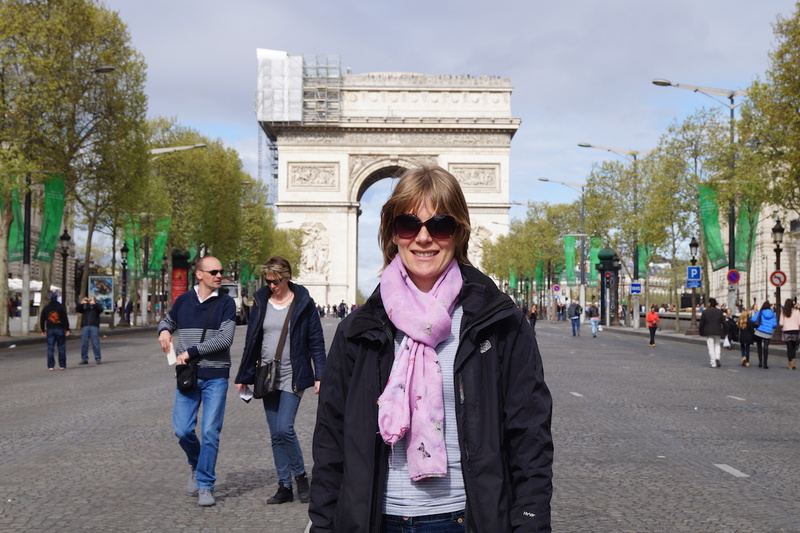 So I finally met up with my wife and brother-in-Law, who have supported me on all my Paris Marathon adventures so far. I do love the Paris Marathon and it really has to be added to the list of Marathon Majors at some point. 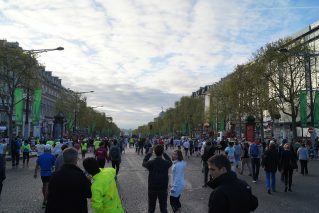 More people run Paris than London and I would argue the route is as beautiful as any of the 6 official majors. In case you don’t know, the majors are London, Tokyo, New York, Boston, Chicago and of course Berlin. To date I haven’t run any of these, but that will change one day. 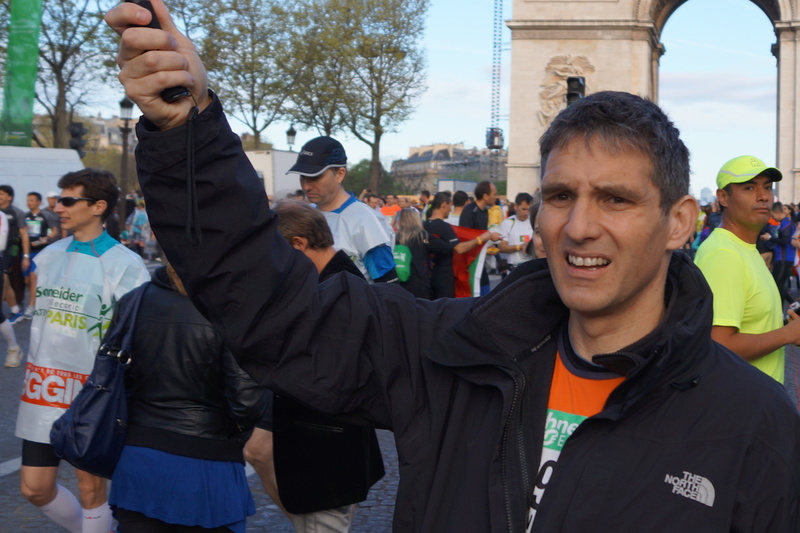 I fully intend to run the Paris Marathon next year and every year as long as I’m healthy and can easily get a place. Currently there is no ballot like London. You just apply early and you’re in. Next year we will try again for a PB. I know I can do it, but next year I will train harder and hopefully I won’t have any annoying injury breaks. The top and bottom of it was that I really wasn’t fit enough. I didn’t do enough long runs and I did only one long run at marathon pace. I think the Worthing 20 was a fluke result and 20 miles is not a marathon. Remember those extra 6 miles make all the difference!